Preparations need to be made whenever you bring a furry friend home and gerbils are no exception. Gerbils are fast rodents that are agile and need challenges such as an exercise wheels and plastic tubing for them to run around. They should be kept in a glass aquarium with a mesh top as wire cages can ensnare their tails. Comfortable bedding should be purchased and changed regularly. In addition you should keep their food bowl away from their water bottle. The suspended water bottles have a tendency to leak after the gerbil drinks from them and who likes soggy food! Gerbils eat pre-made pellets and should be fed and given fresh water daily. Gerbils, like other rodents, will go to the bathroom anywhere, including inside the tubing and their exercise wheels and balls. Be sure to clean all of these components regularly to keep the gerbils and you healthy. 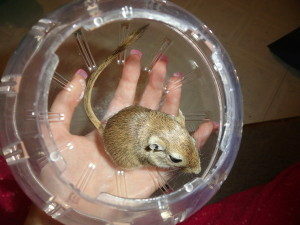 Gerbils make excellent pets and can be handled by younger children. They make a great first pet to teach a child responsibility and how to care for another living animal. 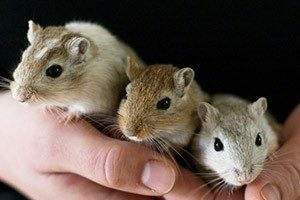 It is best to choose how many gerbils you want from the start. Adding another gerbil later can sometimes cause problems because they may fight one another. Always wash your hands and the surfaces that the gerbils touch to maintain a safe and clean environment. Remember these rodents can jump and climb so always ensure their cages are closed and secure. Have a happy gerbil adventure!